Need to spice up your designs and illustration with some floral swirl vector graphics? 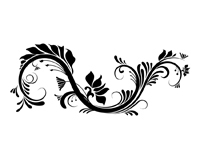 Download this ornamental graphic design with leaves by IdealHut for free. Not sure what to call these free vector by illustration artist IdealHut: swirls, nature ornaments, plant swooshes… Well, I guess you can call them as you want - just hope you like them as much as we do.